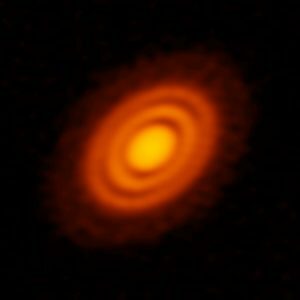 ALMA image of a disk of material surrounding the young star HD 163296. This dusty disk have been known since 2016 to have gaps in it, presumably from newly forming planets. Now astronomers see disturbances in the disk, indicating where 3 new planets are moving within the disk. Image via ALMA (ESO/NAOJ/NRAO); A. Isella; B. Saxton (NRAO/AUI/NSF). … the strongest evidence yet that newly formed planets are in orbit there. ALMA stands for Atacama Large Millimeter/submillimeter Array, and this telescope has been used extensively to study protoplanetary disks since it went online officially in March, 2013. The disks around very young stars like HD 163296 are filled with gas and dust. Stars themselves – and their planets – are born out of this material. So studying the disks is like the studying the birth throes of our own Earth and sun. The two teams of astronomers both used ALMA in conjunction with a new planet-hunting technique that identifies unusual patterns in the flow of gas within a protoplanetary disk.